Every day, families throughout our community and nation are facing difficult discussions about the care of aging loved ones. Often these conversations don’t happen until an incident occurs prompting family members to “take stock” of their loved one’s ability to live independently. These situations are developing rapidly as the baby boom generation ages and Americans live longer than ever before. Today, 46 million adults living in the United States (15 percent of the population) are 65 or older. By 2060, that number is expected to climb to about 98 million, or 24 percent of the population (Population Reference Bureau). 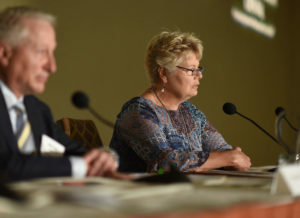 Elder care, as well as the opioid crisis and medical marijuana, data and communication in hospitals, and the Amazon effect, were topics discussed at Central Penn Business Journal’s Annual Health Care Symposium held on July 17 at the Sheraton Harrisburg-Hershey. Homeland at Home served as a presenting sponsor of the event. Barbara Goll, B.S., Community Education Liaison/Nutritionist at Homeland at Home, served as a panel member focusing on elder care. She was joined by Michael Fiaschetti, president and CEO, MediPlanConnect, and the discussion was moderated by Joel Berg, editor of Central Penn Business Journal. Research shows 90 percent of individuals prefer living in their own homes as they age. Caregivers also serve as a critical link to living independently. Training can help family members learn how to care for their loved ones. Homeland at Home offers a full continuum of services to care for individuals as their needs change. Homeland only hires certified nursing assistants (CNAs) to provide services. They are supervised and trained by licensed nurses as Direct Care Workers per Pennsylvania Department of Health guidelines. Homeland at Home also provides at-home physician-ordered medical treatment services through Homeland HomeHealth, and Homeland Hospice provides end-of-life care. To learn more, please contact Homeland at Home at (717) 221-7890.